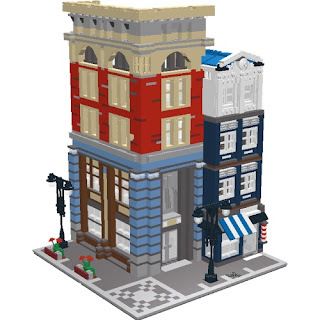 Brick Town Talk: LEGO Factory Gallery: a world of cool creations to be found - LEGO Town, Architecture, Building Tips, Inspiration Ideas, and more! When looking for cool creations made with the new space sets, I found the modular buildings gallery in LEGO factory, and I was astonished with the quallity and number of really cool models I found there. Made by the user copperwonder96 and called Blue Barbershop. And another great thing about these models it's that they can be downloaded by anyone in *.lfx, so that you can see them in LDD. Agreed. There is really some great work being posted to the Factory galley. Pretty amazing considering how limited the part selection is/was with LDD versus MLCad. Of course sticking with LDD you can order a copy of your model directly from Lego rather than hunting for them off of Bricklink.